Picking up a Digital SLR camera can seem daunting, but did you know that the world’s first photographers had to mix chemicals for every exposure? The History of Studio Photography begins with those very first photographers. Not only that, the History of Photography also coincides with some of history’s most important inventions. Inventions such as the telegram, the space race, and attempts to capture color. These technologies, which are now taken for granted, are still present in most of modern photographic technology. In fact, we think that learning the History of Studio Photography and the History of Portraiture is a key element in making great photographs now. In this in-depth dive in to the History of Studio Photography, we don’t just explore Studio Photography from the 19th century until the present day. We also explore the History of Portrait Photography, Types of Portrait Photography and Portrait Photography Techniques. We give you our Studio Photography Tips, including Studio Photography Setup and how to create your very own DIY Home Photography Studio. For portrait photographers, we find inspiration from historically Famous Portrait Photographers like Nadar, Julia Margaret Cameron and Napoleon Sarony. Finally, because what’s the point of studying history if it doesn’t inform our future, we give you our predictions for the Future of Studio Photography. To say photography was invented by just one person would be impossible. Photographic technology hasn’t stopped developing and improving since the earliest photographs were taken in 1824 using all-natural materials. From then, photography has continued its rapid improvements, moving from daguerreotypes and film, to instant photographs and digital cameras. Heliography, the world’s first known photographic process, was invented by Nicéphore Niépce around 1824. The key material of Niépce’s process was Bitumen of Judea, a naturally occurring type of asphalt. He would cover either a piece of glass or metal with this Bitumen, which would harden at a different rate depending on its exposure to light. Once he had finished his ‘exposure’, he would wash the plate with lavender oil. Only the hardened Bitumen of Judea remained, revealing an image of the objects that were in view of the plate. It was this process that allowed Niépce to create the earliest surviving photograph, View from the Window at Le Gras. After Niépce’s death in 1833, Louis-Jacques-Mandé Daguerre invented one of early photography’s most important technologies, the Daguerreotype. This new artform, which was officially invented between 1838 and 1840, followed the same principles as Heliography. Daguerreotypes point of difference was that it involves a developing process. A daguerreotype began with a plate of silver-plated copper, which needed to be artfully polished by a daguerreotypist. The daguerreotypist would then treat the plate with fumes to make it light-sensitive. Once placed in a camera, the plate would be ready to be exposed. Once exposed, the image was made visible by a treatment of mercury fumes. Finally, a chemical treatment was used to remove the light sensitivity of the plate and the daguerreotype sealed behind glass to avoid any blemishes. Compared to Heliographs which more closely resemble a sketch, daguerreotypes create sharp, detailed images. It is perhaps for this reason that Daguerreotypes were the first photographic process to become widely available to the public. The only issue was that Daguerre’s invention needed at least 30 minutes of light exposure to capture an image! Thankfully, there were plenty of would-be photographers working to improve the process. The next few years were an exciting time full of advancements in the science of photography. Hippolyte Bayard discovered how to imprint images directly on to paper using silver chloride and silver iodide. In 1841, William Henry Fox Talbot discovered the calotype, the first known method of multiplying an image. John Herschell experimented with fix-baths, discovering the uses of Sodium Hyposulfite baths. This chemical mix is still used to fix photo negatives today. Finally, and also in 1841, Hippolyte Fizeau invented short focal lenses, allowing exposure times to drop from 30 minutes to just a few seconds. All he had to do was replace Hippolyte Bayard’s silver iodide with silver bromide. With Bayard’s discovery, making a daguerreotype portrait became a relatively quick process. Even though shutter speeds are now one of the first things a new photographer will learn about, they didn’t actually exist for the first 50-60 years of photography. After all, there wasn’t any need; photo exposures were always a matter of seconds or more. During this time, photographers used curtains and other materials to block light before and after the photo negative was exposed. This was all to change in 1871 when Englishman, Richard Meaddox, discovered the value of gelatin. At this point, photographers were using the same, slightly upgraded Calotype technology discovered 30 years before in 1841. With this technology, photo plates of whatever material still needed a few seconds to expose correctly. This limited what could and couldn’t be photographed. By adding gelatin, Meaddox discovered a chemical base that allowed images to be exposed in just a fraction of a second. A few years later, George Eastman, the founder of Kodak, would use that same technology to create celluloid rolls, or film. Although of course, it wouldn’t be history if it wasn’t disputed! With film’s higher light sensitivity and quicker exposure times, using heavy blackout curtains to control exposure was no longer viable. To adjust to the new, fast exposure times, photographers began to focus on creating a mechanism that would control exposure time for them. The first shutters created varied between 1/100th of a second and 1/1000th of a second. Following this, photographers realized they’d need to be able to evaluate light intensity, and so the light meter became an indispensable photography tool. Technically the first ‘color’ photograph was taken by James Clerk Maxwell in 1861. He hypothesized that if he took a black & white photo through red, green and violet filters, then projected these three images on top of each other using three projectors with the same filters, that the human eye would perceive it in the original colors. However, for the most part, photographers, chemists and others working to advance photographic technology still hadn’t worked out how to reproduce color in the late 19th century. Although some artists hand-colored photographs, the effect was never quite believable. For this reason, traditional painted portraits were still largely more popular than photographic portraits. While some photographers continued using Maxwell’s method of superimposing three photos onto each other, this changed in 1891. Gabriel Lippmann, a physicist, found a way to create the first, fixed color photograph. The process, named interferential photography, is somewhat complicated but basically involves exploiting ‘standing light waves’. A regular black & white emulsion is placed backwards into a camera, which comes into contact with a mirror of mercury. The effect is that color is recorded. While this was an incredible breakthrough that saw Lippmann awarded the Nobel Prize in 1908, it was a very complicated process. Technically t is still the only direct process for recording color photographs, but it is neither widely used nor known. It wasn’t until 1935 that color photography became more accessible, thanks to L. Mannes and L. Godowsky. They created a layered film, with different layers that were sensitive to blue, green and red. Combined with a developer that gave color to every layer, color photography became a realizable prospect. Initially created for Agfa and named Agfacolor films, the technology was later bought by Kodak and renamed Kodachrome. While there have since been other technological advancements, even modern film photography relies on these same principles of gelatin, silver bromide and layered film. Believe it or not, the development of digital photography started when it did because of the Space Race. Far from being all about putting a man on the moon, a big part of the space race was winning the ability to spy on your enemies. For obvious reasons, taking a bunch of photos on film in space didn’t make for great espionage. While this race began in the 1950’s, it wasn’t until years later that the most important digital breakthroughs would be made. The first major breakthrough in creating digital photography was the ability to convert analogue signals into digital signals. This was the technology used to create VCRs, but obviously, it wasn’t a complete solution to the digital dilemma. This would arrive with the invention of pixels. In 1957, Russell Kirsch developed a scanner that assessed the varying light signals, saving the different signals to a mosaic of small square elements. He tested his invention by scanning a photo of his young son. This means that technically, the first digital image ever created was actually a scan of an analogue photograph! The technology moved forward in 1969 when George Smith and Willard Boyle created the charge-coupled-device, or CCD. This device converted light into electric signals. A single CCD sensor acted as a single pixel, meaning a group of CCDs would be able to create a mosaic-like image. Their idea was finally realized a few years later, in 1973, when the first CCD imager was created. It boasted a 0.01-megapixel chip! But what about color? No doubt inspired by the red, green and blue layers of film, Kodak scientist, Bryce Bayer, created a digital color filter. Instead of solid layers of each color, Bayer adapted the design so that each pixel would detect a different color. The design was essentially a checkerboard of blue, red and green. Because of the way the human eye sees, the colors were not equally distributed however! A Bayer filter has twice as much green as it does red or blue. Just like silver bromide, layered film and gelatin, the principles of the Bayer filter are still used in cameras today. Of course, since the invention of pixels and the Bayer filter, plenty has changed in photography. Where the first digital camera, invented by Kodak in 1975, weighed 4 kilograms and captured 0.01 megapixels, today phones weighing 150 grams have cameras boasting 41 megapixels. But for the most part, the major technological breakthroughs in photography came between the years 1824 and 1976. At its heart, studio photography is any kind of photo taken in a photography studio, so perhaps we should ask, what is a photography studio? Quite simply, a photography studio is a workspace to take, develop, print and duplicate photographs. This means that really, studio photography could be anything and everything, depending on the vision of the photographer at hand. The options are endless! That said, the major difference between studio photography and all other kinds of photography is that in a studio setting, the photographer is responsible for everything that will appear in any photo that he or she creates. A studio begins as a blank space, an empty room. From there, the photographer needs to develop a backdrop and decide what to include and what to exclude. This could be in terms of props, costumes, models or more. Most importantly though, the photographer needs to create their own lighting. Because the history of studio photography begins well before the history of studio photography lighting, early photography studios made use of painters’ lighting techniques. In fact, this is where the term ‘fine art photography’ comes from. Most painters’ studios had (and still have!) a large, north-facing skylight, which made the most of indirect or reflected light. Basically, the sunlight doesn’t arrive directly through the window at any time of day, meaning the light remains relatively equal. Any photographer knows that soft, diffused light is the easiest to work with, and it was the same for the earliest photography studios! While the earliest studio in the History of Studio Photography was likely that of Niépce, photography studios became far more common around 1840. This was of course due to Daguerre’s invention of Daguerreotypes. Most early photography studios focused on portrait photography because of the commercial viability of the artform. Understandably, people wanted photographs of themselves, their family and friends! In fact, the first portrait photograph made was the 19th century version of a selfie, when Robert Cornelius removed his lens cap and ran into the frame. He sat for a minute and then ran back to cover up the lens once again! In Europe, the 1850s were considered the golden age of photography. Here, photographers pushed the boundaries of photography and propelled the History of Studio Photography forward. The standard studio portrait of the day was a stiff, formal portrait taken using the same, repetitive pose. Photographers like Nadar and Cameron weren’t interested in mimicking everybody else’s work. Instead, inspired by bohemianism and fine art, these famous studio photographers of the era were not afraid to break the rules. No doubt it helped that their subjects were often well-known artists, actors, poets and writers. While studio photography portraits remained largely inaccessible to anyone outside of the upper class in Europe, the United States brought their industrial ingenuity to the task. When daguerreotypes arrived in the US in 1839, they still had an exposure time of about twenty minutes. Americans worked quickly to reduce this. In the meantime, they created props like neck braces to help subjects sit still enough to have their portrait taken. Fortunately, these weren’t required for long, as Americans reduced the exposure time to mere minutes. This was achieved by using mirrors to improve light and chemical adjustments to increase the plate’s light sensitivity. Where European photographers famous to the History of Studio Photography pursued art, Americans pursued business. In fact, by 1850 more than three million daguerreotypes were produced each year in the United States. Indisputably the most important part of photography is light. Capturing a photograph depends entirely on the lighting available, and a cameras ability to capture that light. It makes sense then that not long after the History of Studio Photography began with Nicéphore Niépce, so began the History of Studio Photography Lighting. The first use of what we might call ‘flash’ dates back to 1839, when L. Ibbetson used limelight to photograph microscopic objects. This was perhaps inspired by the theatre, where it became commonplace to light the stage using limelight in 1837. Limelight, produced by placing a chunk of lime into a flame fuelled with oxygen and hydrogen, did not necessarily produce the greatest results though. While others were quick to copy Ibbetson’s experiments, the results were harshly lit pictures. Any photographer will know harsh light means high contrast, and often overexposed skin tones. It wasn’t until 1887 that a slightly more suitable light source became available. A mechanism for using Flash Powder Photography. Just as photographers and scientists worked doggedly through the 19th century to discover the next big break in the History of Studio Photography, so they worked to create the next artificial light source. The main ingredient: magnesium. Magnesium, when burnt, showcases a bright white light. When combined with a reflector, it makes for ideal artificial photography lighting. Magnesium wire, commercialized by Edward Sondstadt, was bent and twisted into diverse shapes by photographers from 1864. Just like limelight however, it wasn’t without issues. Magnesium wire was unpredictable and somewhat uncontrollable. The entire wire didn’t always burn and the speed of burning varied, making predicting exposure times difficult. The burning wire also filled the air with grey fumes, which was obviously problematic for Studio Photography settings. Regardless, photographers continued to use magnesium wire lamps throughout the 1870s and 1880s. In 1887, the technology moved forward again although not necessarily in terms of safety. Adolf Miethe and Johannes Gaedicke combined a magnesium powder with potassium chlorate to create flash powder. Potassium chlorate, commonly found in traditional gunpowder and crackers, mixed with the magnesium to create a bright flash of light. Flash powder photography meant that photographers could take almost instant photographs even in the dark. However, being an explosive, it also meant that flash powder accidents were a common occurrence. Many photographers created the mix themselves, a process that unfortunately saw many photographers meet their end. Isn’t it strange to think there was a time in the History of Studio Photography when preparing for a portrait session meant risking your life? Believe it or not, the history of the flash bulbs also begins with the history of underwater photography. Louis Boutan, the world’s first known underwater photographer, needed a source of light underwater and so he sealed powdered magnesium in a jar, attached to a lead-weighted oxygen barrel. This principle was utilized by a few land photographers over the years, however it was the Hauser Company in Germany who created the first true old photography flash bulbs in 1929. The Hauser Company replaced magnesium with aluminum foil sealed in oxygen, which was set alight by an electronic battery. The light that emanated from the bulb was powerful, but it lost the harsh qualities of previous artificial lights. At long last, a soft and diffused artificial photography light had been invented. This article didn’t write itself. Show your appreciation by buying us a cup of coffee. After all, what goes around comes around. While it would take a few years until flash bulbs were available commercially, they rapidly changed the face and history of photography. Flash bulbs were the first safe method of artificial lighting, that produced neither smoke nor an explosion. This made flash bulbs ideal for all kinds of photography, but especially for Studio Photography. In fact, not long after this, mass-market cameras came equipped with a synchronizer that allowed a bulb to fire when the shutter opened. This enabled photographers to set the shutter speed instead of opening and closing the shutter manually. In this sense, the flash bulb also signified the beginning of on-camera flash and the technology used to synchronize big studio photography lights. Photo courtesy of the Smithsonian American Art Museum. Gift of Mr. and Mrs. Richard F. Young. Around the same time that flash bulbs were being developed, so were electronic flash ‘tubes’. In 1931, an American Electronic Engineer and photographer, Harold Edgerton, invented the first electronic flash or ‘stroboscope’. He did so by connecting a battery to a bulb filled with mercury. The volt of current from the battery would cause the mercury gas to ‘excite’, creating a bright flash of light. This electronic flash could be easily manipulated by using different charge times, giving photographers control of the flash duration. The flash could be as rapid as 10 microseconds, allowing him to capture iconic photographs like a bullet moments after piercing an apple, or an egg breaking as it was dropped into a moving fan. This was a significant step forward in the History of Studio Photography Lighting. Moreover, the flash could recharge thanks to the battery, making Edgerton’s invention the first rechargeable flash. Finally, he replaced the mercury with xenon, allowing the tubes to be smaller. Even though strobes weren’t easily available for small photography studios until the late 70s, the basis of Edgerton’s design is still used in modern electronic flashes. One of the most important Studio Photography Basics is undoubtedly the Studio Photography Setup. As with most aspects of photography though, there are a range of options. These options, regardless of photography type, mainly focus on lighting. They start with simple natural light setups ranging up to sets that involve 5 or more lights, modifiers and tethering. Lighting aside (because we’ll get to that soon! ), there is one major element that contributes to a Studio Photography Setup: the backdrop. When it comes to Studio Backdrops, the options seem to be endless. A studio photographer can choose between Seamless Background Paper, Paper Rolls, Material Backdrops including sequined fabric, Vinyl backdrops… The list goes on! Of course, the backdrop a Studio chooses will depend entirely on the mood, style and type of photography. The studio backdrop will traditionally go against a wall. In a natural light studio, it would need to be close to the studios windows to make the best of the light. In a photo studio that uses flash, it doesn’t particularly matter as long as there is space for the various lightstands and light modifiers. Perhaps the only type of photography studio that would consider a drastically different Studio Photography Setup would be that of a posed Newborn Photography Studio. For obvious reasons, a newborn is unable to stand and it’s best not to expose a newborn to bright, flashing lights. For this reason, newborn studio photographers tend to invest in special pillows and raised platforms, as opposed to a traditional backdrop. They also use simple lighting setups that involve a single softbox and reflector. The possibilities of what to include or not to include in a list of Photography Studio Equipment are endless. Obviously the most important items include a camera that has manual capability, some kind of light source and a backdrop. 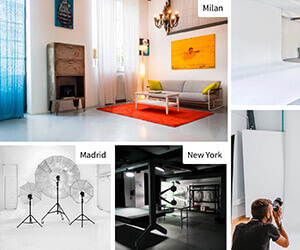 Fortunately, MisterLocation has created a comprehensive list of potential Photography Studio Equipment. These days, Studio Photography Lighting has come a long way from flash powder photography and old camera flash bulbs. Thankfully, it’s also much safer! While it would be impossible to discuss in detail all the potential lighting options, there is one major decision to be made. This decision is whether continuous lighting or flash light is the right set up for the Studio’s intended style and type of photography. Continuous lighting involves turning on the studio lights and leaving them on! This makes adjusting your camera settings much easier, however it’s not ideal when using models. This is because the bright light can be unpleasant or even dangerous to look at consistently. Instead, continuous lighting is ideal for commercial and product photography. On the other hand, Flash Light is best for models and for shooting any subject that will be in motion. This is because flash has the effect of capturing or freezing motion. This is how Harold Edgerton was able to achieve his iconic shot of a bullet as it passed through an apple. Asides from the type of lighting that a studio photographer uses, there are other important factors to take into consideration. This includes of course the type of photography, ambient light and any necessary light modifiers. Natural light or a studio with a single light and a reflector might be all the lighting gear needed to take successful studio portrait photographs. If a studio intends to take product photographs however, the number of lights needed is more significant. For example, a product photographer might choose to use a 5-light set with a variety of softboxes, or they might use a light tent with 4 surrounding lights. If you’d like to learn more about Studio Photography Lighting, be sure to check out our list of Best Online Photography Classes. There’s no doubt about it, photography can be an expensive hobby – especially when you want to do studio photography! Thankfully, these days there are plenty of online tutorials detailing how to set up a DIY Home Photography Studio. All it takes is a spare room or an old shed, and a little bit of determination. Obviously the first thing to do is consider the kind of photographs you’d like to make. If you prefer natural light, big windows will be vital. If you like shooting with flash and artificial lighting, a basement or underground space will do just fine. Once you have your lighting sorted, the last piece of important equipment for a DIY Home Photography Studio is a backdrop. If you can’t install a permanent studio backdrop into your Home Photography Studio, look into a collapsible backdrop. At first, invest in a neutral color so that you’re not limited to a specific style. Finally, get shooting! If you’d like to invest in a DIY Home Photography Studio, check our list of the Best Websites to Buy Photography Gear! From the moment Robert Cornelius took his self-portrait, portraiture has dominated the History of Studio Photography. In fact, portraiture was the first genre of photography to be commercialized. Despite long exposure times, sitting for a photographic portrait was far quicker than sitting for a painted portrait. With the rapid development of photographic technology, the commercial viability of Portrait Photography only increased. All of a sudden, wedding portraits, newborn photos and family portraits were available to the wider public as well as the wealthy. Even today, Photography Studios that specialize in portraiture exist across the globe. But what actually is Portrait Photography? Put simply, portrait photography is a photo of an individual or a group that aims to showcase their personality, a point of view, or record a particular moment in time. If we go a little deeper though, portrait photography is actually about the subject’s face. The role of a portrait photographer, whether taking a head shot in a police station or a portrait of a newly married couple, is to take a photograph where the subject’s distinguishing facial features are clearly rendered. Traditional Portrait Photography is a portrait when the subject is aware of the photographer, and their face is the predominant element of the photograph. Generally, this requires that the subject look directly at the photographer. When a person is photographed within their ‘natural environment’, so to speak, this is classed as Environmental Portrait Photography. A good example of this would be a portrait of a child playing in their bedroom or a portrait of a chef cooking in his restaurant’s kitchen. An old glamour portrait. Photographer and model unknown. Where in a traditional portrait the subject is aware of the photographer, in Glamour Portrait Photography the subject is not only aware, but is posing to enhance their appeal. Essentially, Glamour Photography is an attempt to capture an individual’s glamour, which is defined as “an exciting and often illusory and romantic attractiveness – the Glamour of Hollywood.” Depending on who you ask, glamour portraits can be historically attributed to magazines like Vogue, historic studio portraits of Hollywood stars, or even French street vendors who sold postcards of women posing provocatively. Candid Portrait Photography on the other hand is a portrait taken when the subject is not aware of the camera’s presence. These images are real and spontaneous and tend to exhibit the true emotion of the situation. When taking a true Candid Portrait, the photographer will have limited control over their surroundings. A mix between Candid Portrait Photography and Environmental Portrait Photography, Lifestyle Portrait Photography aims to show a person interacting naturally in their chosen environment. This style of portrait photography has grown in popularity with the rise of digital cameras and is especially popular for family portraits. Conceptual Portrait Photography is a style of portrait photography used often when depicting artists like musicians or actors and in advertising photography. The portrait is composed with an underlying concept in mind, which may or may not be revealed to the audience. In these portraits, the human subjects are there to complement the concept. Quite simply, Surreal Portrait Photography involves taking a portrait that plays on the lines of reality and non-reality. While this might seem like a new movement developed with the advent of editing software like Adobe Photoshop, surrealism is actually a movement that started in the 1920s. Perhaps the first famous portrait photographer, Gaspard Félix Tournachon was a French writer, caricaturist, and photographer. Tournachon, who began publishing his work under the pseudonym Nadar early on in his ‘media’ career, was quite the eccentric. Having fallen in with a group of Parisian bohemians, he began to submit caricatures to newspapers, which quickly became popular. It wasn’t long until he took this talent to photography. Being the showman that he was, his first photography studio was painted in solid red apart from his name, which was scrawled across 15 meters of the studio’s façade. While Nadar was lucky to have the opportunity to photograph his famous bohemian friends, such as Charles Baudelaire, this wasn’t the reason for his photographic acclaim. At the time, portrait photographs were stiff and formal. Nadar brought his sense of humor to his photos and made his portraits all about the human subject. He placed his subjects against a plain background and played with fine art lighting techniques. The diffused light, different to the flash powder of the time, brought out all the features of the sitter’s face and dress. He then used his knowledge of the person to bring out their true personality. While Nadar wasn’t technically the photographer, instead employing a team of photography staff, his art direction and knack for experimentation with developers, focal lengths and lighting were vital to his work. While Nadar contributed heavily to the history of studio photography, especially the development and History of Portraiture, after a few years he grew bored with portraits. From there, he moved on to shooting underground using artificial lighting and aerial photography. In fact, while not so relevant to the History of Studio Photography, Nadar was also responsible for the first ever aerial photo, which he took from a hot air balloon over Paris. There are two types of photographers. First, there are those who know the technical details of their equipment and process like the back of their hand. And then there are those who teach themselves how a camera works without ever getting into the technical nitty-gritty. Safe to say, Julia Margaret Cameron was one of the first Famous Portrait Photographers to fall into the latter. Julia Margaret Cameron, born in Calcutta, India, didn’t pick up photography until relatively late in life. In 1863, when she was 48 and the mother of six children, Cameron was gifted a camera. To use it, she converted a chicken coop into a studio and used a coal bin as her darkroom. While her early attempts at photography often failed, she progressed quickly and began taking portraits of her friends. They included the likes of Sir John Herschel, Alfred Tennyson and Charles Darwin. Of her camera she wrote, “from the first moment I handled my lens with a tender ardor, and it has become to me as a living thing, with voice and memory and creative vigor.” She applied the principles of fine art photography to her work, inspired by the Pre-Raphaelite painters with whom she was friends. The Pre-Raphaelites sought a return to abundant detail and complex compositions. Cameron, who was devout in her religion, used this to inspire many theatrical, biblical-inspired photographs. She never hired professional models or took on commissioned portraits. Instead, she asked friends, family and even her household’s staff to pose for her. Julia Margaret Cameron’s photos were not universally proclaimed, however. Being unbound by technical constrictions, Cameron’s work was often criticized by the photography community. Her photos often featured fingerprint marks, cracked photo plates and out of focus subjects. In fact, there was quite the media battle between publications who celebrated her work and publications who believed it didn’t warrant a place in the History of Studio Photography. The Illustrated London News wrote that her work was “the nearest approach to art, or rather the most bold and successful applications of the principles of fine-art to photography”. On the other side, the Photographic Journal wrote, “slovenly manipulation may serve to cover want of precision in intention, but such a lack … of masking it are unworthy of commendation”. Cameron however, was seemingly unbothered by the kefuffle, preferring to focus on her commitment to poetry and beauty. These days, Cameron is seen as the first photographer to put emotion before technique, and for this she is widely acclaimed. Canadian Napoleon Sarony was said to be quite a theatrical person. This led him to become the most well-known photographer amongst New York City’s late 19th century creatives. Sarony’s photography studio, which he opened in New York in 1864, was known for pushing the boundaries of photography at the time. He tended to use longer exposures and created a ‘posing machine’ so that his models could sit still in a variety of poses. That said, Sarony didn’t actually take the photos himself. While he created the scene and the pose, his cameraman, Benjamin Richardson, took all the photos. Unlike any of his contemporaries, Sarony believed it was important to credit his cameraman. The importance Sarony placed on giving artistic credit didn’t stop with Richardson. Asides from his groundbreaking style of photography, Napoleon Sarony is also famous for being the first to copyright his work. Naturally, this also meant he was first to run into legal issues with broken copyright. When a company made and distributed copies of Sarony’s portrait of Oscar Wilde without permission, he took them to court. The case went all the way to American Supreme Court where Sarony won the first copyright lawsuit relating to photography. Sarony’s fight for recognition can be seen as the start of photography’s transition to an art form rather than a science. It also kicked off a battle photographer’s still fight today for legal protection and recognition of their work. Loop Lighting is perhaps the most common type of studio portrait photography lighting. This is because it creates a flattering light on most faces. Simply, it creates a small shadow of the subjects nose on their cheeks. Apart from this, the lighting is relatively soft and equal across the subject’s entire face. To set up loop lighting in your studio, place a single light source slightly above and behind your subject(s). Then place a reflector opposite the light, but in front of your subjects, to bounce the light onto their faces. Just make sure the reflector is slightly above your subjects and not below them! Butterfly Lighting creates a very flattering shadow and is commonly used for glamour portraits. It creates definition of the face by casting a shadow along the cheeks and slightly below the nose. Butterfly lighting is also relatively easy to achieve! Simply place the light source behind the camera and slightly above eye level of the subject. Place the camera directly between the light and the subject and start experimenting! Split Lighting does exactly what you would imagine in that it bathes one half of the subjects face in light, while the other is in shadow. This is a useful technique if you want to create a dramatic portrait. As with any photograph, there are no set rules to achieving this, but it’s a matter of trial and error. You only need one light to achieve split lighting, which should be placed 90 degrees to the left or right of the subject. Take a test shot and continue adjusting the light and your camera settings until you’re happy with the results. Rembrandt Lighting is named because the lighting it creates is reminiscent of a Rembrandt portrait. That is to say, it creates a moody portrait where the subject is placed in a triangle of light. This triangle usually falls to one side of their face. To successfully use the Rembrandt lighting technique, it’s important that the light falls above the subject’s head. This will create a shadow that falls from their nose to their cheek. It helps as well if the subject is angled to face slightly away from the light source. In any studio lighting situation, it’s important to make sure you use a ‘catchlight’ when taking portraits. A catchlight is a light source used specifically to create a reflection in the subject’s eyes. Without this, the subject’s eyes will appear flat and lifeless. Finally, with all artificial studio lighting it’s important to ensure the ambient light of your studio isn’t interfering. To do this, simply test the set up. At first, this will involve a lot of trial and error. Once you get the hang of it though, you’ll know intuitively what camera settings you need and how much ambient light is too much or not enough. In portrait photography, the background is rarely important as the focus is almost always on the subject. This is true of lifestyle portraiture and studio portraiture. In a studio setting however, the photographer often has a little more leeway to play with high apertures. If you want a soft focus, where the subject’s features aren’t all perfectly sharp, opt for a low aperture like f1.8. If you’d like the photo to be crisp and clear, set the aperture as high as you can. As a general rule, studio portrait photographers set their shutter speed to a maximum of 1/200th of a second. This is because 1/200th of a second is the usually the maximum sync speed of studio flash units. Finally, it’s best to set your ISO as low as possible for your lighting set up. The choice of lens can be vital to successfully making the portrait you’re imagining. If the lens is too wide, you’ll likely include too much detail and lose the intention of your portrait. If the lens is too tight, it’s likely the opposite will occur! But before even discussing focal length, there’s the question of zoom or prime? A zoom lens is a lens that has a variety of focal lengths, making it easy to take diverse photos with very little effort. A prime lens has just one focal length, called fixed focal length, however they generally provide a much better image quality and impressive clarity. As a general rule, most photographers prefer to use primes. With this in mind, you can begin to think about preferred focal length to capture your ideal portrait. While it would be impossible to declare that one length is better than another for all portrait photographs taken in a photography studio, the most popular lengths tend to be a little shorter, between 50mm and 100mm. A 200mm lens will likely be too tight in any studio! The final major point to take into consideration when choosing a lens for portrait photography is its aperture. Aperture determines the amount of light the camera allows in, as well as the depth of field. If you want a very clean portrait with all the objects in focus, having a lens that allows you to shoot ‘wide open’ isn’t important. If you’d prefer to have a soft focus, say for example a portrait where the subject’s eye is in focus, but the rest of their face is blurred, you will need a lens with an aperture of f/2 or below. The composition of a photo is a key element to creating a powerful, interesting or emotive portrait. There’s a reason that traditional portraits are similar. For example, daguerreotypes often showed a person from just above their waste, angled slightly to the side but looking straight at the camera. This pose is one that works! In the same way, there are a few easy tricks to successfully compose a portrait, whether in your photography studio or outside of it! The Rule of Thirds is one of the first rules of composition. It helps to create a balanced and interesting photograph, whether in landscape photography or portraiture. This is likely why you’ll be able to find a feature enabling a grid to appear across your phone camera screen! Basically, imagine that your photo is broken down into thirds horizontally and vertically. Your photo will now be broken down into 9 parts. The four lines that do this are ideal lines along which to position your subject. The points where these lines intersect are especially important. When it comes to portraits, try placing your subject’s eye at one of these intersections, or the top of their head along the higher line. Straight lines, while not necessarily a composition technique, are also a great way to create a more impactful portrait. Although perhaps less important in a studio setting, always make sure that any props you involve, or windows placed in the background of a natural light photography studio, are straight. Wonky lines and horizons are distracting and will take the focus away from your subject. Composition norms aside, one of the easiest things to focus on when composing a portrait is the subjects head. This is likely where the audience of any photo will look first. As a general rule, it’s best to angle their head slightly down, or to shoot from slightly above the subject’s head. Shooting upwards is rarely flattering! Finally, while there are plenty of rules to be found, rule-followers rarely create groundbreaking work. As seen by studying French Photography in the second half of the 19th century, “the medium’s most profound and lasting expressions [were] … of those who consciously set themselves apart from the accepted rules of commercial practice.” Basically, learn the rules, but once you’ve learned them don’t be afraid to break them! While having all the right equipment and the correct set up certainly helps to take good portrait, in the end it’s important to remember that a portrait is a human interaction. Think about Nadar who believed that knowing and understanding his subject was the key to taking an interesting portrait! With this in mind, we’ve created a list of easy tips for taking better portraits. Change angles. Move in and out. Get down on their level. While taking portraits, especially at the beginning of the session and even before it begins, talk with your subject. Find common ground, distract them from the fact that they’re having their photo taken! After all, it can be quite intimidating having a camera focused specifically on you. Try to find something that makes them laugh or that makes them reflect and use that moment to capture their natural expressions. Standing still and remaining at the same level an entire portrait session is a surefire way to get static images. It might make sense to start that way, but as your subject warms up to the portraits, try moving around. Move away from them and then move closer. Capture the details of their face and photograph their whole body. Kneel down and stand on tippy toes or your studio’s handy stepladder. The portraits you produce by using different angles might surprise you. They say the eyes are the window to the soul. Use this! Find a way to make them laugh and capture the twinkle in their eyes. Open your aperture right up and focus on just one eye, capturing perhaps just half of the subject’s face. These portraits will evoke emotion and reveal the subject’s personality. Seeing as the History of Studio Photography is as old as the History of Photography itself, we don’t predict that it will end any time soon. Studio Photography enables photographers a chance to take photos in a way that wouldn’t be possible outside of the studio. This is especially true of advertising and product photography. Perhaps the biggest change in the Future of Studio Photography will come in terms of the industry. While Photography Studios used to be thriving, stable long-term businesses, they are now struggling to remain relevant. The appeal of travel and the ease of new styles of photography like Lifestyle Photography mean families, individuals and businesses are more likely to employ their local photographer than a traditional studio. Fortunately, the share economy offers an opportunity for studio owners to capitalize on their space in another way. While photographers and creatives increasingly look towards living life ‘on the road’, we doubt they’ll stop wanting to create the style of photographs only possible inside a studio. In the spirit of photography’s founding fathers, we believe the Future of Studio Photography is full of invention and innovation and we will work hard to make MisterLocation help shape it. We can’t wait to watch the next chapter of the History of Studio Photography unfold. What about you? Rhianna May is an Australian wedding & lifestyle photographer and copywriter based out of Milan, Italy. When she's not writing or shooting, she's usually drinking coffee at her favourite bar or making plans for her next trip to the sea.